Professional is the word that comes to mind when you hire Great Lakes Excavating for all of your concrete and asphalt removal projects. Whether commercial, industrial or residential, we can handle just about any concrete or asphalt removal project. 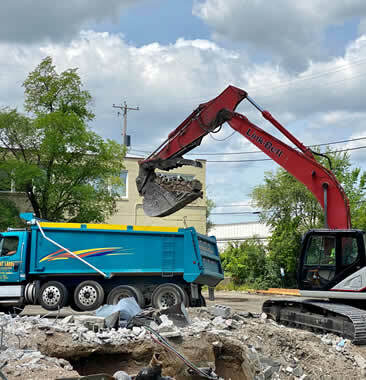 With our full fleet of trucks and excavating equipment, we can haul away all of the concrete and asphalt debris from your land. after the concrete. We are the one stop solution for all your pavement and concrete demolition and removal. We have proved ourselves over the years to be reliable and affordable. Experience is key along with highly trained professionals to get your concrete removed.